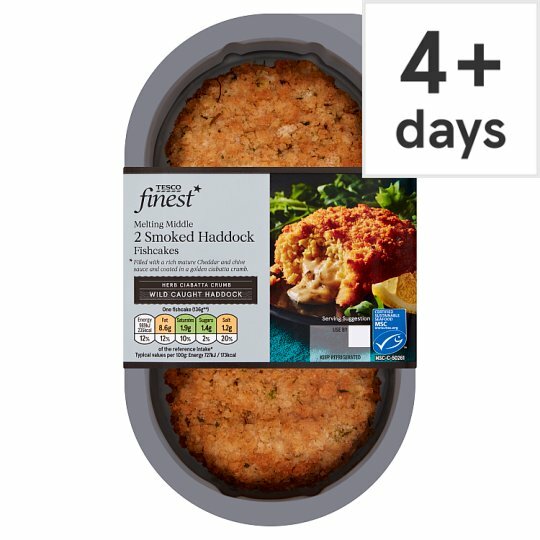 Pieces of smoked haddock and haddock (Melanogrammus aeglefinus) fillet and mashed potato with an extra mature Cheddar cheese sauce centre, coated in a chive and parsley breadcrumb. INGREDIENTS: Haddock (Fish) (20%), Smoked Haddock (20%) [Haddock (Fish), Salt, Colours [Curcumin, Annatto]], Potato, Wheat Flour [Wheat Flour, Calcium Carbonate, Iron, Niacin, Thiamin], Water, Rapeseed Oil, Double Cream (Milk), Dried Potato, Milk, Wheat Starch, Extra Mature Cheddar Cheese (Milk), Durum Wheat Semolina, Cornflour, Chive, Salt, Wheat Gluten, Olive Oil, Lemon Juice, Fish Gelatine, Worcester Sauce [Water, Black Treacle, Spirit Vinegar, Tamarind Concentrate, Salt, Onion Powder, Garlic Powder, White Pepper, Pimento, Ginger, Paprika, Clove], Parsley, Yeast, Black Pepper, Colour (Paprika Extract), Sunflower Oil. Instructions: From chilled: 220ºC /Fan 200ºC/Gas 7 18-20 mins Place on a pre-heated baking tray in the centre of a pre-heated oven. Instructions: From frozen: 220ºC /Fan 200ºC/Gas 7 30 mins Place on a pre-heated baking tray in the centre of a pre-heated oven. Caution: Although every care has been taken to remove bones, some may remain.Caution: Hot centre.Immediately after cooking the centre of this product will be extremely hot.Allow it to cool slightly before eating.